SW Safety continuously monitors key trends in its target markets, and quickly adapts to new and changing customer needs. An important workplace trend today, and especially in manufacturing facilities, is the use of vending machines to dispense PPE – including gloves – to employees. Vending machines can help improve safety compliance by ensuring proper glove selection, reduce costs by managing inventory, and reducing waste. 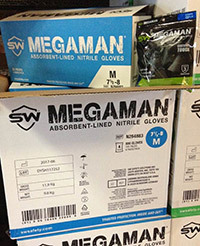 In response to this growing need, SW is now offering its popular Megaman glove (“Certified Tough” ANSI 3 abrasion) in a new vend-pack ready package, available with 4-pairs of gloves. Megaman is the first SW product available in vend packs and was chosen because of its versatile, multi-use properties that allow facilities to consolidate glove styles and introduce state-of-the-art perspiration management in a single use glove. Megaman Vend-Packs are available now! Download the Product Specification Sheet here and be sure to contact your Regional Sales Manager or email Customer Service for any additional information, including pricing. This entry was posted in 2017 Newsletter and tagged megaman, Nitrile Gloves, vending, vending machine on October 27, 2017 by swsafety.